This is one heck of an inspiration. I think it’s safe to say that most of the girls out there have been through something like this at least once in their life. It’s becoming difficult to trust people with your personal mobile number nowadays as you end up receiving annoying texts or even calls from unknown numbers. The worst part is that you don’t know who it may be. It can be anyone, even the guy who changed your engine oil. Yep, that’s right. 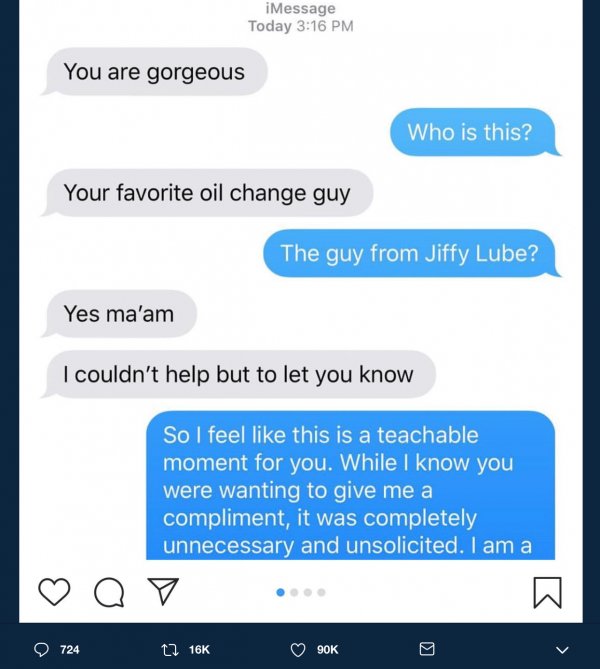 Recently a woman received a text from a Jiffy Lube employee saying “You’re gorgeous”. And upon asking who it was, he replied “Your favourite oil change guy”. That’s not all. The conversation went longer than expected, but it’s not what you are thinking. The woman gave him a reply that won all our hearts! 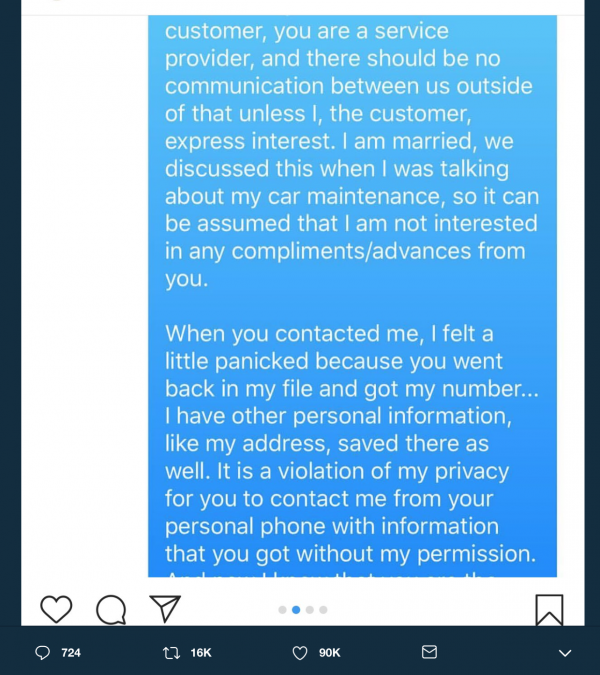 Her sister @LoveableandKind posted the entire thread on her Twitter account and here’s how it went. This tweet took a hit and currently has over a 100K likes and almost 20K retweets. Now, that is epic! Here are all the screenshots of the messages for you. A teachable lesson for all of you creeps out there! 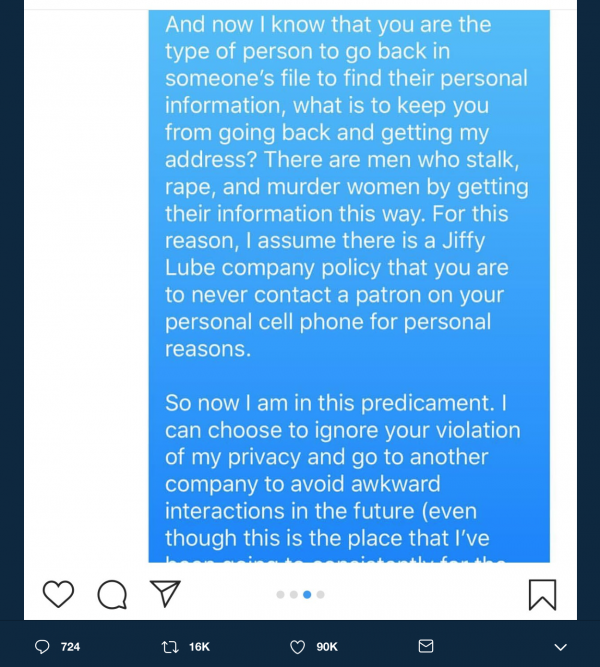 I wonder if she ever took action against him or not. I totally love that last message though. I’m sure it has you all in hysterics too! Her words must have left quite an impression on him as we can all see the immediate change in his attitude and tone. And not just on him, she left an impression on most of the internet. While some men, in particular, defended this kind of act, others fully condemned it. Check out how people responded to this post. Oh, the satisfaction of getting such a pleasant wish! Your sister is amazing and I hope she finds a twenty in the pocket of her favorite jacket that she hasn’t worn in a while. That’s right; she smashed it! Yes, that was quite something. 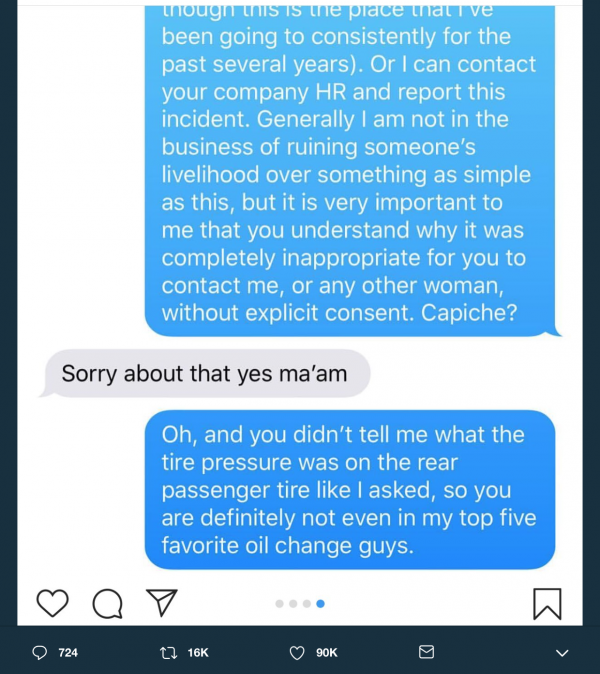 Surely her ‘favourite oil change guy’ must have learned a lesson by the way she replied to him. Not just him, even we are going to take some lessons from her now! Although she was a bit panicked and struck at first, she came out to be a knight in shining armour for all of us in the end. Hopefully, you enjoyed this post, but we will only know if you share it as much as you can. So go on and share away!